Another Thursday. 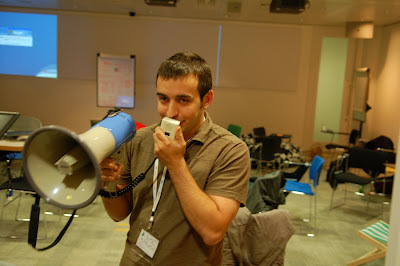 Another London Google Open Source Jam. This time the format couldn't have been simpler: Come to Google. Have some beer, have some pizza. Talk about whatever you like. John Ripley. Rewriting Vorbis. From Scratch. Since 5 minutes can seem like a really long time we also introduced something new: Lightspeed talks! Pow! Don't have enough to fill 5 minutes? Don't have slides? Don't worry! Stand up and say your thing. 30 seconds. 5 seconds. A single word perhaps! Talks start conversations, conversations start projects, projects are good! 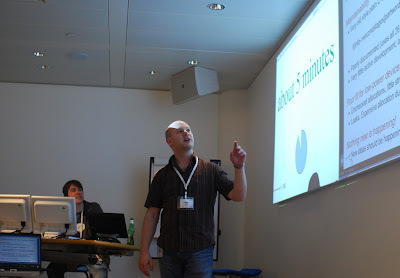 Joe really wanted to spread the message about MVC for AJAX web apps. Don't know about the London Open Source Jam yet? Where have you been? OS Jam is a free for all, open to anyone, geek night where open source hackers get together to discuss a topic close to their hearts.